Like many other closeted musical lovers...I rarely expose my wondrous joy at watching the Sound of Music for the fiftieth time. But occasionally a musical comes along that strikes you so directly you are unable to squash that desire to scream its name from the roof tops! The Tampa Bay Performing Arts Center has produced just such a musical in Wonderland: Alice&apos;s New Musical Adventure. Rarely does Tampa Bay Entertainment have the ability to produce such an uplifting musical performance. There are no Concerts Tampa that would even come close to rival the outpouring of emotion from Wonderland. If you had the ability to attend this year&apos;s Tampa Bay & Company Annual Luncheon then you, like me, experienced two of the songs from this upcoming musical. It would take a Tampa Bay Evacuations for me to be anywhere but TBPAC&apos;s Ferguson Hall on December 5th. Lucky for me...that is my birthday so everyone in Tampa Bay will know to throw in and get me tickets as my present! Yes...I admit...I was that geek in high school who LOVED theatre and truly longed to be involved professionally with any Tampa Bay Production when I grew up. Of course that was not to be but my love for the theatrical lives on and I attend as many Tampa Bay productions as I can. My most recent favorite musical was Jekyll & Hyde. Not only do I have the entire production of Jekyll & Hyde on disc but I have it memorized as well! I cry every time I hear Someone Like You. It makes perfect sense that I would be drawn to Wonderland because they both have the same composer, Frank Wildhorn. All of Tampa, Florida will be drawn to hear the music of this man. He moves me to tears and while yes...that is not too terribly difficult I can assure you that you will be moved as well. 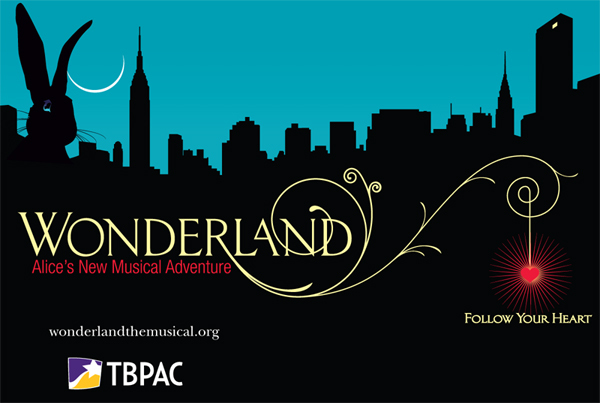 If you, like me, are dying for more sneak peaks at Wonderland: Alice&apos;s New Musical Adventure then come to the next Tampa Bay & Company Business By the Bay at the Tampa Bay Performing Arts Center on November 17th at 5:30 p.m. in Carol Morsani Hall. I promise you won&apos;t be disappointed!